Students from NES project schools across the country are attending the NASA Explorer Schools National Student Symposium at Johnson Space Center, Houston Tex. Students are presenting their investigation or design challenge findings to NASA personnel and other students attending the event. Other activities include an astronaut presentation, facility tours, student activities and a career awareness panel. To earn an invitation to the symposium, students conducted an investigation or design challenge and presented it to a panel of NASA personnel during the NES Virtual Student Symposium. Get an overview of the problem sets, suggestions for implementation of best practices and some extension activities including additional Space Math problems that may be appropriate for your curriculum. Professional Development – Percentage and Volume: Space Food and Nutrition-How Much is Waste? Go through three mathematical computations to determine usable and unusable portions of foods. The seminar includes an extension activity comparing mold growth on bread and tortillas in order to see why tortillas are an acceptable bread substitute in microgravity. The forms of packaged food products that are fine for travel on Earth are not always suitable for use on space flights. There are limitations to weight and volume when traveling and the microgravity conditions experienced in space also affect the food packaging.NASA Now: Balloon ResearchDebbie Fairbrother, Chief Technologist in the Balloon Program at Wallops Flight Facility in Va., discusses two types of high-altitude balloons NASA uses to test scientific instruments and spacecraft. Prepare to be amazed when you find out how big the balloons are and much mass they can lift. 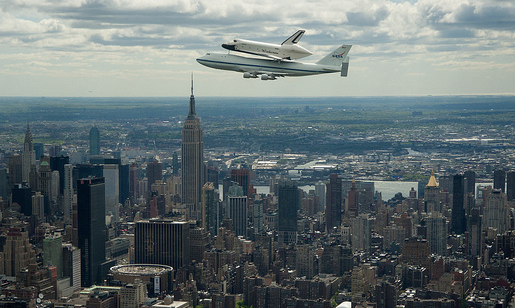 NASA’s 747 Shuttle Carrier Aircraft with Enterprise mounted atop flew at a relatively low altitude over various parts of the New York City metropolitan area near a variety of landmarks, including the Statue of Liberty and Intrepid. After the flyover it landed at JFK International Airport.The Federal Aviation Administration coordinated the flight. Several weeks following the arrival, Enterprise will be “demated” from the 747 and placed on a barge that will be moved by tugboat up the Hudson River to the Intrepid Sea, Air and Space Museum in June. The shuttle will be lifted by crane and placed on the flight deck of the Intrepid where it will be on exhibit to the public starting this summer in a temporary climate-controlled pavilion. The Intrepid continues work on a permanent exhibit facility to showcase Enterprise that will enhance the museum’s space-related exhibits and education curriculum. For more information about NASA”s transfer of shuttles to museums, visit https://www.nasa.gov/transition. NASA Explorer Schools educator Kaci Pilcher Heins from Northland Preparatory Academy used the NES featured lesson Satellite Meteorology to introduce weather and climate to her sixth-grade students. Even though the lesson is written for upper grades, she modified the lesson using her own extensions. 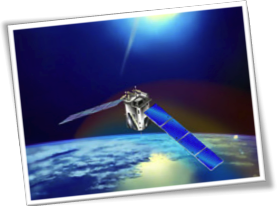 To find out more about the Satellite Meteorology lesson, go to Weather and Climate: Satellite Meteorology on Facebook or to the Satellite Meteorology forum in NEON. Meet Fernando Zumbado, a NASA Robotic Systems Engineer who works with the Multi-Mission Space Exploration Vehicle, or MMSEV. Zumbado explains how the robotic MMSEV vehicle is designed to adapt to its environment, capable of both in-flight missions and surface exploration of microgravity bodies. A key NASA instrument that can directly measure the impact of solar events on Earth’s upper atmosphere has “weighed in” on the huge flare that impacted Earth recently. The flare was considered one of the largest solar events in years, even though its impact on the power grid and communications was minimal due to the angle it hit Earth. To read more and watch a video about this huge solar flare, visit https://www.nasa.gov/mission_pages/sunearth/news/saber-solarstorm.html.This feature story acts as an excellent extension to the NASA Explorer Schools featured lesson Geometry: Space Math Problems — Solar Storms. In this lesson, students use geometry and measurement to track solar activity. This lesson can be found in the lesson library on the NES Virtual Campus. In celebration of Earth Day 2012, Becky Bolt, a wildlife ecologist at NASA’s Kennedy Space Center in Florida, will answer student questions about how scientists study wildlife and how this research helps support space operations. Learn how to use the mission’s Staying Cool activities to lead students through an examination of different solutions to the problem of how to deal with too much sunlight and energy. 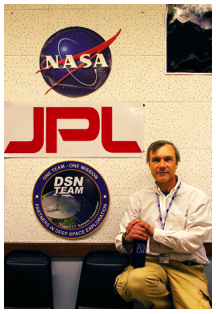 NASA research scientist Stephen Kane will answer questions from students in grades 4-12 about a study he co-authored showing there are 100 billion planets in our galaxy. Review the NES calendar for other upcoming events. Have you Heard the one About the Rubber Chicken? Last month, when the sun unleashed the most intense radiation storm since 2003, peppering satellites with charged particles and igniting strong auroras around both poles, a group of high school students in Bishop, Calif., knew just what to do.They launched a rubber chicken.The students inflated a helium balloon and used it to send the fowl, named “Camilla,” to an altitude of 36.6 km, or 120,000 ft, where it was exposed to high-energy solar protons at point blank range. Camilla flew twice–once on Mar. 3 before the radiation storm and again on Mar. 10 while the storm was in full swing, giving the students a basis for comparison. If you’re interested in ballooning, check out the NES lesson, Engineering Design: Forces and Motion — Balloon Aerodynamics Challenge (requires log in to the NES Virtual Campus website). 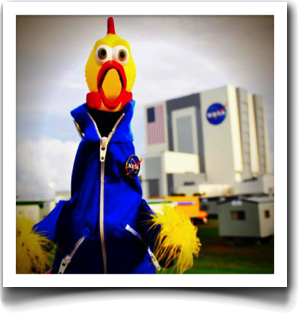 Author John EntwistlePosted on April 20, 2012 June 19, 2013 Categories UncategorizedTags Education Point of Interest, Engineering Design Challenge-Balloon Aerodynamics Challenge, NASA Point of Interest, NES Lesson-Balloon Aerodynamics Challenge1 Comment on Have you Heard the one About the Rubber Chicken? If you have to chose just one night in April to go out and look at the stars, NASA scientists say it should be Saturday, Apr. 21st. By the end of 2012, NASA’s space shuttles will be in their new homes. Recently, the shuttles were on the move as part of the transition and retirement activities at NASA’s Kennedy Space Center in Florida. On Feb. 1, Bart Pannullo, NASA vehicle manager for transition and retirement, watched as shuttle Endeavour was backed out of the Vehicle Assembly Building and towed to Orbiter Processing Facility-2. The next day, shuttle Atlantis made an appearance outside the VAB as it was towed from the VAB transfer aisle into high bay 4 for temporary storage. Atlantis is being prepared for public display at the Kennedy Space Center Visitor Complex in 2013. 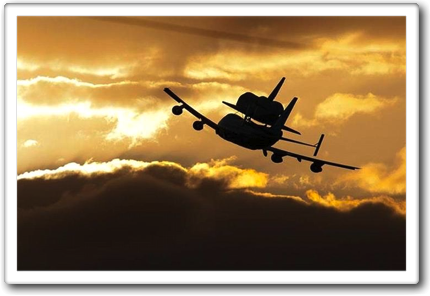 To read more about the final destinations for NASA’s historic space shuttles, you may visit https://www.nasa.gov/mission_pages/shuttle/flyout/shuttles_tr.html. This story is a great extension to share with your students after completing the NASA Explorer Schools featured lesson Linear Regression: Exploring Space Through Math — Space Shuttle Ascent. This lesson can be found on the Virtual Campus website.